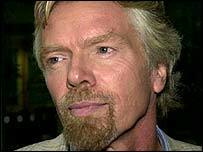 Sir Richard Branson plans to hold talks with the government about paying for a new oil refinery. The Virgin Atlantic boss told the BBC he wanted to reduce his airline fuel bill, which has increased by £300m a year over the last two years. He said there was an "enormous shortage" of oil refineries and said he was looking at building one. 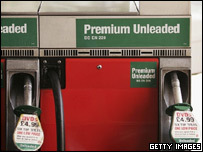 Fuel prices have been hitting record highs due to the knock-on effect of Hurricane Katrina in the US. Sir Richard's comments came as a price war broke out between petrol retailers as oil supplies returned to normal following the chaos caused by the hurricane. Esso confirmed it was lowering its UK petrol and diesel prices on Friday by up to 4p a litre, following similar moves by supermarkets Asda and Tesco. Meanwhile, BP and Royal Dutch Shell also said they planned to cut prices. The hurricane hit oil rigs and refineries in the Gulf coast of America, causing worldwide supply shortages in both crude oil and petrol. That caused a hike in prices, which have risen rapidly over the last few years. Sir Richard said oil refineries were "very expensive" adding: "This is not something I particularly want to do." But, he said: "At the moment there's an enormous shortage of refineries in the world. "Every one of the refineries is at capacity, the oil companies are not building new refineries, and we have put a team on trying to raise money to build at least one." The fuel bill for Virgin Atlantic and Virgin Express was in the region of £750 million a year, he said. "If we could just bring that fuel bill down by just a tiny amount that would make a big difference to us and our customers. "If we can encourage governments to confront this issue, if we can get western governments together to work out how to deal with the issue, we think we can make a real difference." Sir Richard said it would take at least four years to build a refinery and he was also looking at ways to find oil. Governments should aim to build 10 refineries as soon as possible to counterbalance oil companies and the oil cartel, Opec, which kept prices high, he said. "Opec is effectively an illegal cartel that can meet happily, nobody takes them to court," he said. "They collude to keep prices high. "The western world should have a counterbalance to that. If $20 billion was put aside to build 10 new refineries, oil prices would start to collapse again. "The oil companies realise that and they are not getting out there investing the money to build those refineries. "In a sense, as free marketeers why should they? But governments should intervene to make sure that happens." A "two-pronged" government attack was needed to tackle the problem, he said. "If they intervene in the short term and do something too radical to stop growth, we will have an incredible recession." Governments should encourage companies to buy fuel efficient planes and trains and give tax breaks to companies which produced fuel efficient hybrid cars, he added. It would be better to tax "fuel-inefficient" airlines than to tax all airlines for the fuel they used, he said. On Thursday, Opec said the rise in fuel prices was not the fault of producers, who had accelerated output in recent years. It told the BBC's Newsnight programme that everyone, including producers and consuming nations, had to do their part to solve the problem.